Want to quickly end a phone call on iPhone 4? 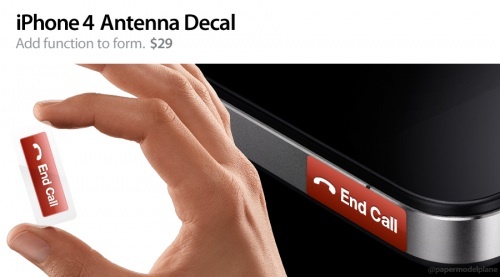 No problem, just press this self-installed End Call button decal! OK I doubt this would work, and in fact it would probably prevent the bars and calls from dropping, but it’s amusing nonetheless. We just got this picture in our inbox, the sender didn’t provide a source but the picture is definitely funny. It looks like it’s supposed to be a parody of something available on the Apple site and I highly doubt it’s actually for sale (of course, knowing the internet it will probably become available for sale soon). Personally I find the iPhone 4 antenna hooplah to be overblown media hype, but some of the jokes and iPhone 4 humor floating around is just hilarious. Update: the decal is the work of talented designer Aaron Draczynski, thank you to those who tracked this down. I just got an iPhone 4 today and the signal loss is real. I am right handed but I hold the phone with my left hand when surfing and I hold it with the left edge of my palm up against the antenna gap. Definitely affects signal strength and data rate. During a call I tend to hold it differently so it doesn’t affect calls. The bumper does seem to improve the situation. You know, applying that sticker to that area would actually insulate it and stop the problem from happening, therefore no longer ending calls when you touched it. Pretty poorly thought out in my opinion. Also I got one today as well, and touched all the antenna crosspoints. My signal went up. I would like to thank my high iron diet. The creator of this image is @gdgt’s own @papermodelplane. You can see his mark in the lower right hand corner of the image. Please attribute it to him! I found these online if anyone wants one. There at iphonesticker.info and cost $7 for a set of two of them with free shipping. Antenn-Aid is another great spoof iPhoneSavior.com launched this past weekend. It probably inspired theis latest sticker idea. I just bought a leica sticker @ http://www.stickerware.com, realy cool, the flat surface has such sweet customization possibilities! Wanna have this one too!!!!!! !